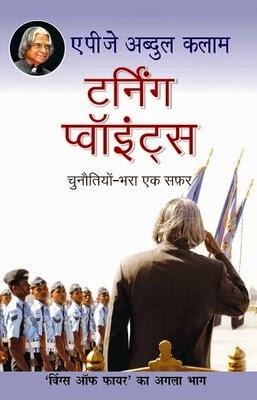 Turning Points (Hindi) is the sequel to the bestselling Wings Of Fire, the autobiography of former President of India, A. P. J. Abdul Kalam. In recent times, the post of the President of India has never attracted as much attention as during the period when it was held by Dr. Kalam. A scientist and a visionary, a dreamer and a patriot, A. P. J. Abdul Kalam brought passion and drive to the post during his tenure. Turning Points (Hindi) picks up the strings where Wings Of Fire ends. It begins with the interesting tale of how Dr. Kalam received the news that he was being offered the post of the highest office in India. He received a phone call from the then Prime Minister Vajpayee when he was at the Anna University campus, after giving a lecture there. The book then describes the interesting and important events while he was in the post. But it focuses more on his vision for his country and his efforts to make it a reality, than on himself. He describes the changes he initiated in the Rashtrapati Bhavan, like installing virtual conferencing facilities, renovating the Mughal Gardens and so on. He also describes some interesting experiences like his meeting with Field Marshal Manekshaw. He made the President’s office accessible to everyone, and he used his post to share his vision for the country’s future with the youth. He initiated projects like PURA for Providing Urban Amenities in Rural Areas. A strong advocate of the use of technology in all aspects of governance, he set an example by making use of all the technology available to him while at office. He installed some technological facilities in the President’s office and also ensured instant access to all necessary information from the Planning Commission and other departments. The personal anecdotes he provides of his time at the office are about the well known ones, like the time he sent back the Office of Profit Bill, and his offer to resign after he lent his approval to the controversial dissolution of the Bihar assembly. He focuses on how he used electronic mail in the whole process as he was in Moscow when the Bihar incident happened. For anyone who shares his vision and his passion to see the country in a strong position in all aspects in a short period of time, Turning Points (Hindi) is a good read. The book reads more like an exposition of his Vision 2020 than an autobiography. Dr. A. P. J. Abdul Kalam is a scientist and a former President of india. 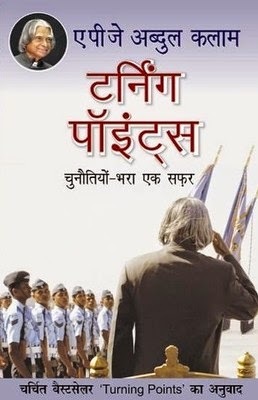 Other books by Dr. Kalam include India 2020: A Vision for the New Millennium, Ignited Minds: Unleashing the Power Within India, and Wings of Fire: An Autobiography. Dr. Avul Pakir Jainulabdeen Abdul Kalam was born in 1931 in Rameshwaram, Tamil Nadu. He graduated with a degree in physics from St. Joseph’s College in Trichy. He later studied aerospace engineering for his Master’s degree. He worked at the DRDO and ISRO. He played a vital organizational role in the Pokhran II Nuclear Missile Test in 1998. He became the eleventh President of India in 2002. The honors he has received include several honorary doctorates, the Veer Savarkar Award and the Bharat Ratna.